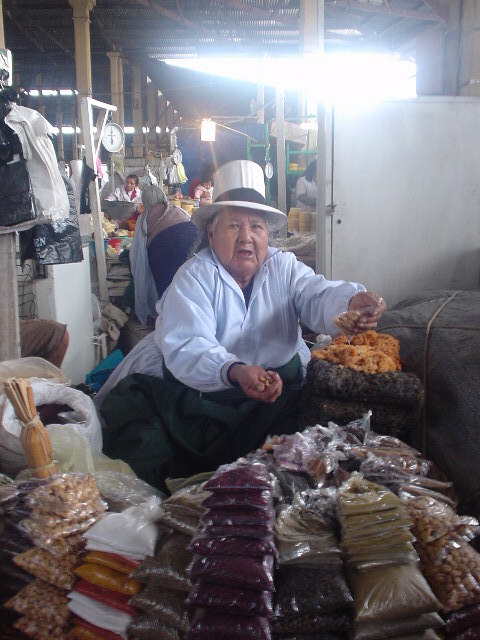 The Quechua or Campesino person that works in the market likes to call me Papa, I call her Mama because she is funny. She is fat and friendly, with many layers of clothing covering her body. She is my pepper and peanut salesperson. I guess if I need to buy bulk spices, or maybe a big bag of peanuts, rice, or beans or anything similar to that I would go and see her. There is a whole row of the same type of products, and for .50 soles or about 15 cents U.S. I can purchase a bag of pepper or peanuts. This is a very good value, and one-tenth the cost of the tourist area. I have been thinking a lot lately about explaining how the market culture works in the world. It would be fun to make a map of Cuzco showing the various places where you can buy different products. 1. Big city ran markets normally with a name and special building. 2. Smaller neighborhood convention markets. In these two above, there will be sections like a grocery store. You will have bread rows, spice and grain rows, comedor or a food area row; in Cuzco, they have a juice row. Chicken row, Beef row, and on and on with many persons selling their produce. What is interesting is they are all trying to compete for the same clients. There is hardly a wink of difference between the person next to the other. Therefore, for Mamacita I just stop chose a person and purchased my pepper, I could have walked three more steps further and purchase the same bag of pepper for the same price. In most of the world, because the USA and Europe are not the world, but only a small part of the world there exist market streets. Therefore, Europe and USA together are about 600 million people or only about 10 percent of the world population. It is hard to have respect for such a small percentage of the planet making such a great big noise. Therefore, as I was saying most of the planet has market streets. It is like a convention mentality. There will be conventions in Chicago for different types of businesses; you will have various types of conventions. These conventions are big business and are everywhere in the world, and I guess they help the companies quickly sell their goods. I suppose this is mostly wholesale. Calzados or shoe convention streets. Everyone of these street has many of the exact same type of business, so being I understand these countries and I have been trying to make some backpack and sow up some special Hobo products to sell, then what am I trying to do? I want to find the backpack street. 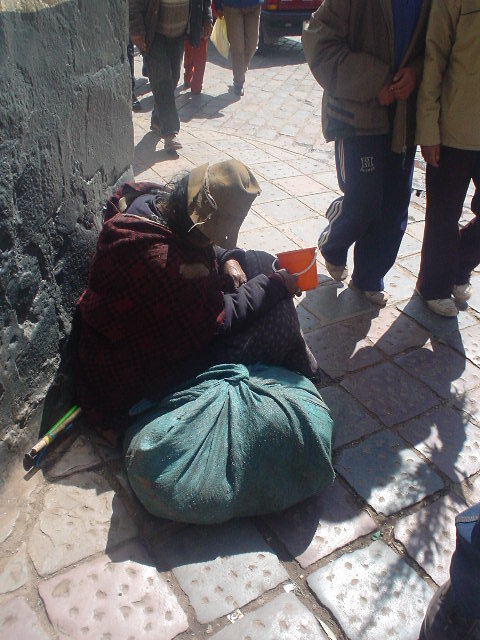 There is no backpack streets in Cuzco, but there are some sowing streets where they also will try to make backpacks. I can find small sowing street, which is different from the tailor streets. A tailor is a person that makes Sunday go to meeting clothes, while a sowing street is going to repair clothes for half the price and not be so good at it, but nonetheless they could be very good and the tailor could be bad. I have learned so many times in my life that money has very little to do with the skill or quality of work. I suppose it has to do the quality of the parents, that lends itself to the children, and then of course we hope to find God given talents. I personally am a natural for computer, I am not a natural for grammar, and I may in some realms be a natural for gift of gab writing. So there many conventions of the same type suppliers, this applies to Ferreterias or Hardware shops. This makes life a little easier in ways because you can go and shop around and make a good decision or a bad decision all in one spot. What is interesting is that the good and bad decisions are distributed around so that all the places have work, and nobody really starves. I am having multiple modifications made to my travel pants at this one Tailor down the street, I think he is about a 3 on a scale of 10 of skill sets for tailors, but I am using him a lot. Why? Because he actually works and finishes something, while the other too bright for their britches Tailors are mentirosas or liars and do not finish anything. Life is about what we finish and not about what we talk about or start. Therefore, a slow progress turtle can beat the hare. I am annoying the tailor and I have only a few more modifications before I have to find another, I am annoying him because I keep asking him to change his work and do it again. I want the pants perfect, and will not allow him to make modifications in the wrong way. Every time I ask him to change what he did, it is in a way a small insult, I am saying. I do not like his work, he has no talent for deciding what is fashionable or engineered correctly. I see a lot of engineering going into pants. I believe I can get a great size 34-waist pants made now, but how would I do the 30, 32, 36, 38, 40, and so on. But he does finish his work and for that I will work with him, better than brilliance with no completion. The make pants in most of the world extremely loose or extremely bad fitting. Extremely loose forgives a bad tailor for bad skills; extremely tight pants make the girl look either good or awkward. In these I cannot afford to buy top end pants countries, they wear awkward clothing. In most of Asia they do not have a body so they are flat and the clothe fit no matter the quality of the tailor. Well, when you go to a city in South America, Asia, or India, Africa, see if there is a street full of vendor of your favorite sales persons. Fun when you find the leather street, or the guitar street, lot of fun streets for buying. I have a link on HoboTraveler.com where I am attempting to induce people to submit great places to buy great products. Peru is good to buy X, before they come, and maybe they can go and buy what they dream about. By the way, 90 percent of a persons time spent as a tourist is buying, so they really ought to think about this…! The old, the little crazy, the sick, where do they go in the world? The United Nations does not focus on the problem. They want to save people by getting rich countries to send money to poor countries. The solution is to force, coerce, bully, extort the bosses of Peru to take care of their own people. They have the money, they just do not care. The USA cannot save a poor country; the poor country has to save itself. I am much more inclined to give to a beggar with a profession; at least I have an excuse. I do not feel guilty in the least when I see a beggar. I do try to help, and when I meet individual in power in these cities, I do take the time to make them feel ashamed for being so callous as to let the rest of the world come in and be idiots. Give money, but no solutions, the governments of countries can solve problems fast. On the other hand, in any country in the world there will be beggars. 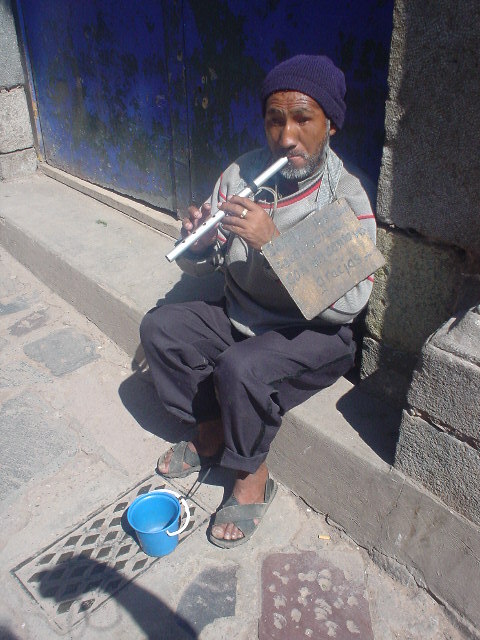 There are a percentage of persons that want to be beggars.